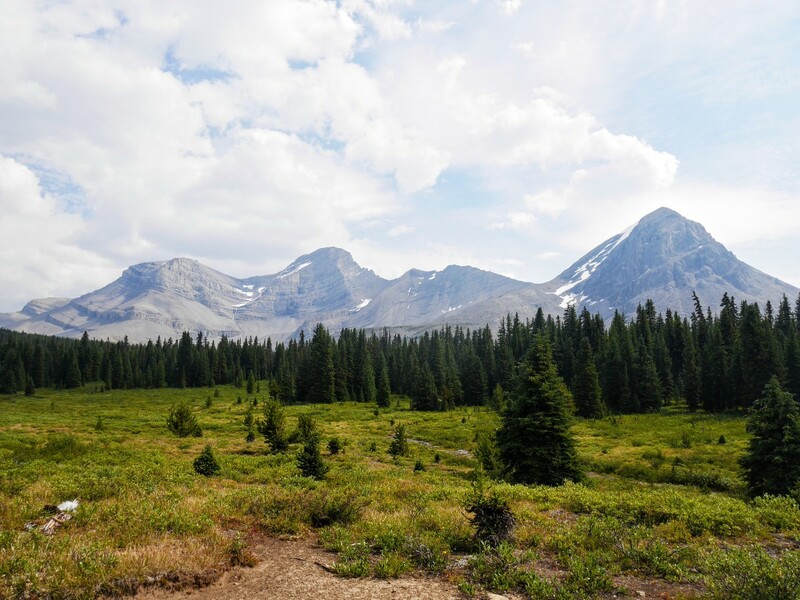 The hike to Sunset Pass & Sunset Lookout follows a strenuous trail that hikes along a backcountry artery and through a meadow with views to the remote White Goat Wilderness Area. The steep initial ascent means crowds are low, but rewards are high. If you want a shorter day you don’t need to do both hikes. From Lake Louise, drive north on the Icefields Parkway (Highway 93N). 16.5km past the Saskatchewan River Crossing, turn right onto a gravel driveway with an information kiosk a few metres in. We’ve combined the hike to Sunset Fire Lookout and Sunset Pass into one big day. Alternatively, you can do one or the other. If we had to choose to hike only one of the hikes, hiking to Sunset Pass would win out. The trail to Sunset Viewpoint and Sunset Pass starts by winding its way up through dense forest. Hiking the first kilometre is rough, with many exposed roots & rocks. 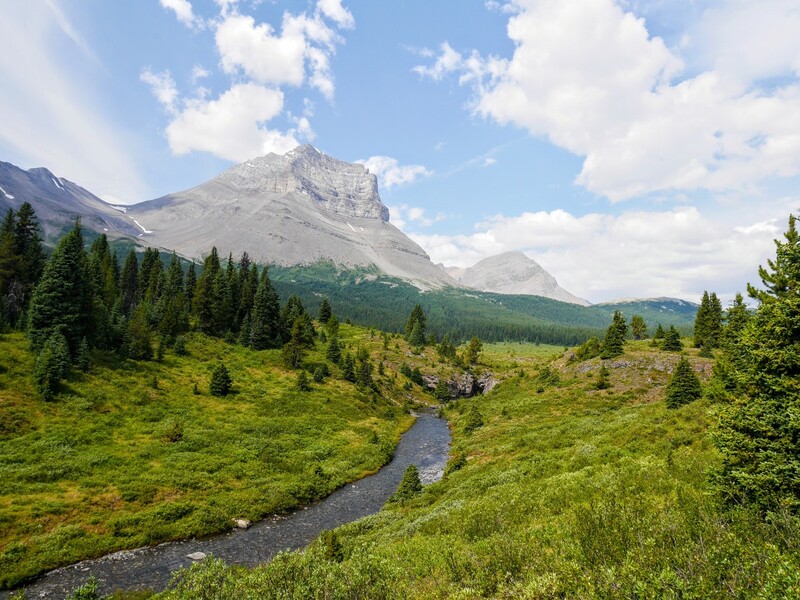 The first section of this hike is an aggressive ascent – 545m of elevation gain over 2.9km, which is an average grade of 19%. Bright red buffalo berries, the favourite food of grizzly & black bears, grow in abundance beside the trail. 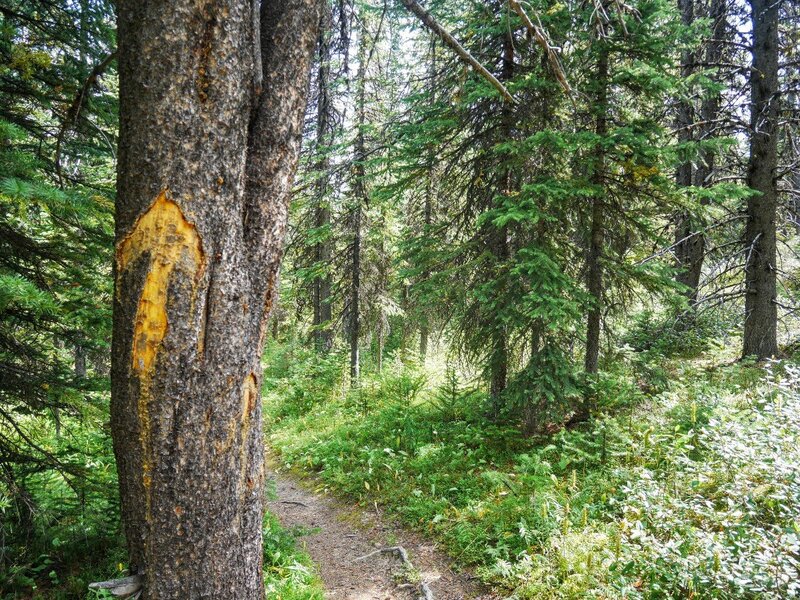 The bears use many of trees along the trail as rub trees, some even display claw marks. In steep terrain like this, bears prefer to use human trails for ease of access, so bear spray is a must. As you climb higher, the sound of running water becomes louder. On the 7th & 9th switchbacks, side trails to the south branch off towards the sound. Skip the first trail. The second trail provides a far better viewpoint of the spectacular and hidden Norman Creek Falls. The energy of the water, descending such a steep course to the valley bottom, has carved out an impressive canyon. The waterfall cascades down into many plunge pools. At this point, you’re only a quarter of the way up the initial climb. 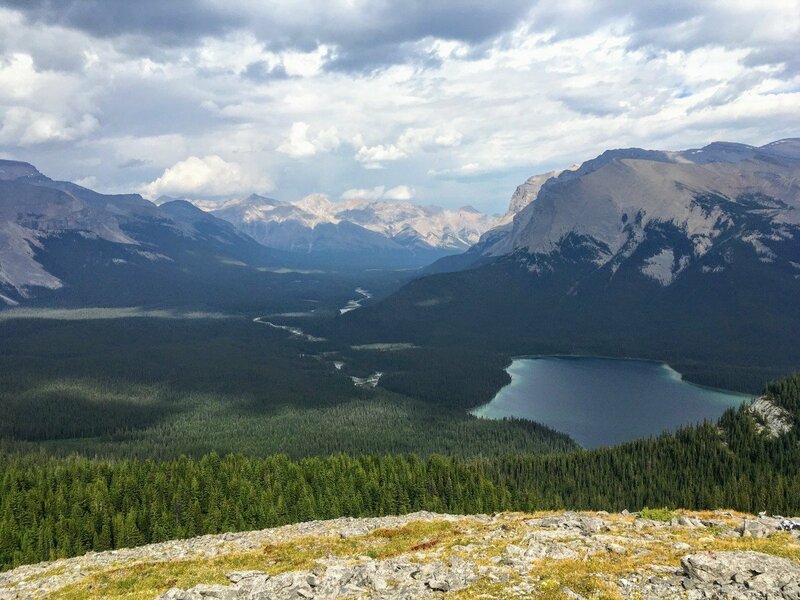 The hike continues switch backing steeply up – 39 switchbacks in total – until you reach the junction with the Sunset Lookout trail. A nice sunny clearing in the woods makes for a good rest spot. Our GPS shows going to the Lookout on the way up, and we describe the route below in that order. We suggest saving the trip to Sunset Viewpoint on the way down though, as you’ll have a better idea of your energy levels and how much light you have left. The trail to Sunset Lookout appears flat on the map, but gains another 100m of elevation along the forested slopes of Mt Coleman. No easy hiking yet. 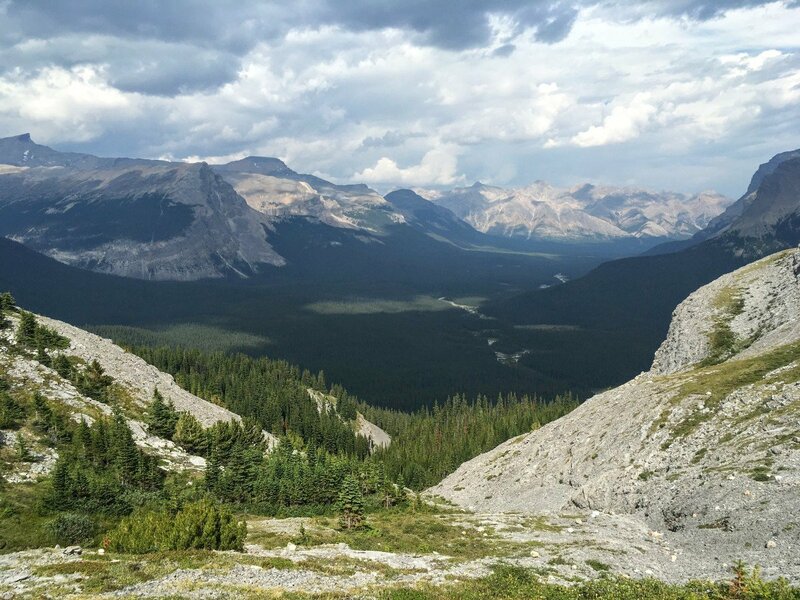 60m before the lookout the trail descends steeply, ending atop a 450m limestone cliff overlooking the Icefields Parkway. This was once the site of the Sunset Fire Lookout, in operation from 1944 until 1977, when helicopter patrols rendered it obsolete. The foundations, conductor cables and some insulators are still present. The site offers a panoramic viewpoint of the Saskatchewan & Alexandra Rivers merging, the braided channels of both creating a patterned valley bottom. 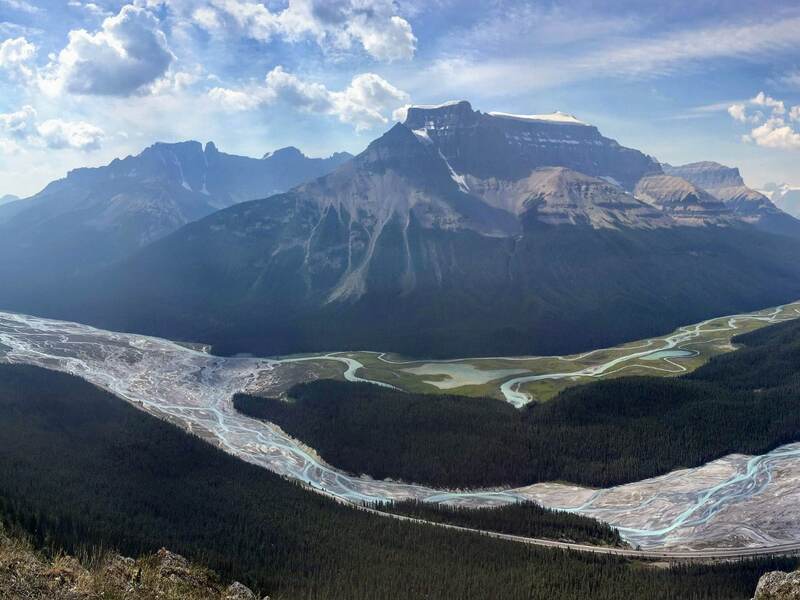 Mt Saskatchewan, 3342m, on the edge of the Columbia Icefield dominates the view in front. 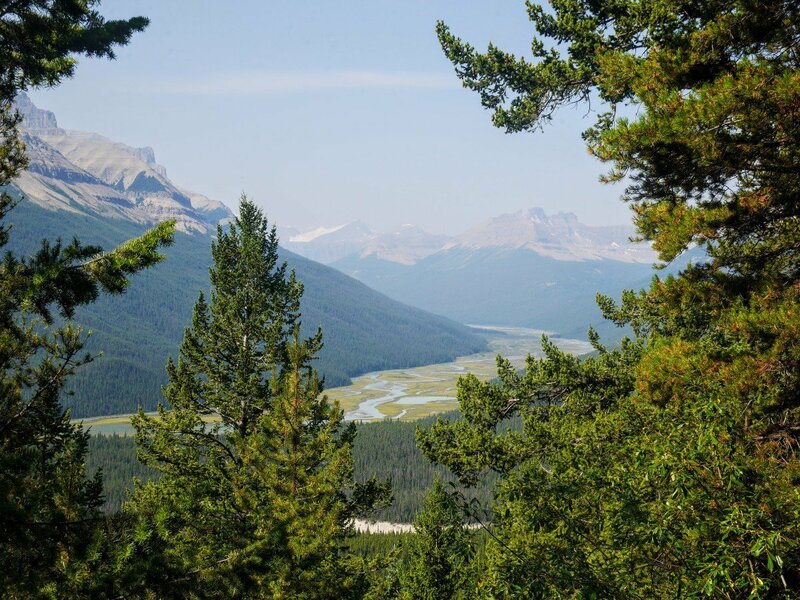 To the east, the Saskatchewan, Mistaya and Bow River valleys all align, allowing views to the 60.0km distant Bow Peak in clear weather. Returning to the junction, continue up a few more gentle switchbacks, until the trail makes a sharp turn to the right. An arrow carved into a tree on the side of the trail marks the way. 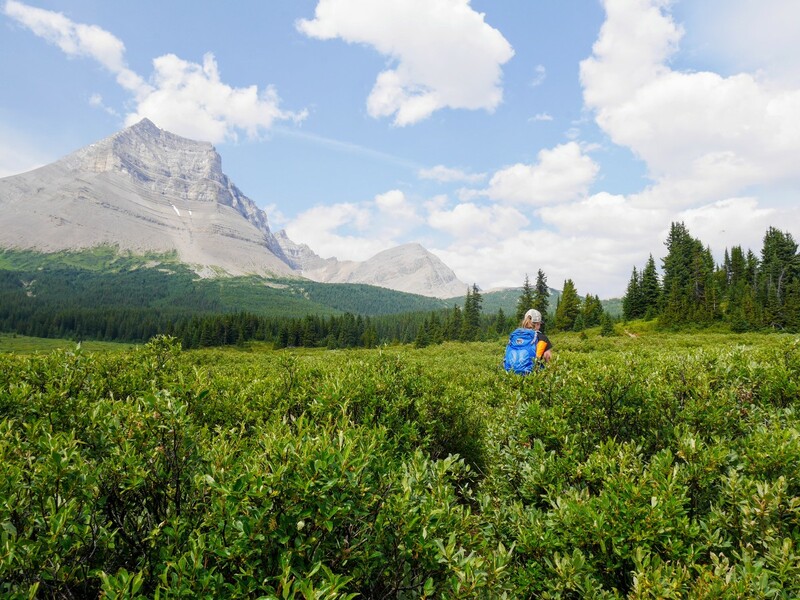 After a few hundred meters, you emerge at the edge of Sunset Meadows – a large, wet, willow-filled alpine meadow. Descend to the picturesque Norman Creek again. The bridge was out on our last trip in July 2017. Depending on time of year, the creek can be jumped or rock hopped, or you may have to cross at the shallowest place. Cross where you can see the remains of the old bridge, just as the trail pulls alongside the creek. A stand of spruce trees a little way in front of you houses the Norman Lake Campground. Many trails wind away into the woods, to campsites, outhouses and food storage. Turn left at the fire pit to continue to Sunset Pass. For the next 2.5km the trail skirts the edge of the meadow, then cuts across, crossing Norman Creek again. Look for stone markers on the riverbank that point out the best place to cross. The trail continues, ostensibly to the true Sunset Pass, to the right, so the creek crossing (and the trail to the Pinto Lake viewpoint) can be easily missed. On the other side of the creek the willows grow thicker, denser, and higher. To anyone off trail, the route would be invisible. In some places willows were growing chest high, almost touching over the top of the trail. But, the views to Mt Coleman, 3135m (in front of you to the north) and Mt Wilson, 3260m (behind and to the right, southwest) are fantastic. The lack of shade on hot days can be problematic, although there are plenty of small channels of water to cool off with. 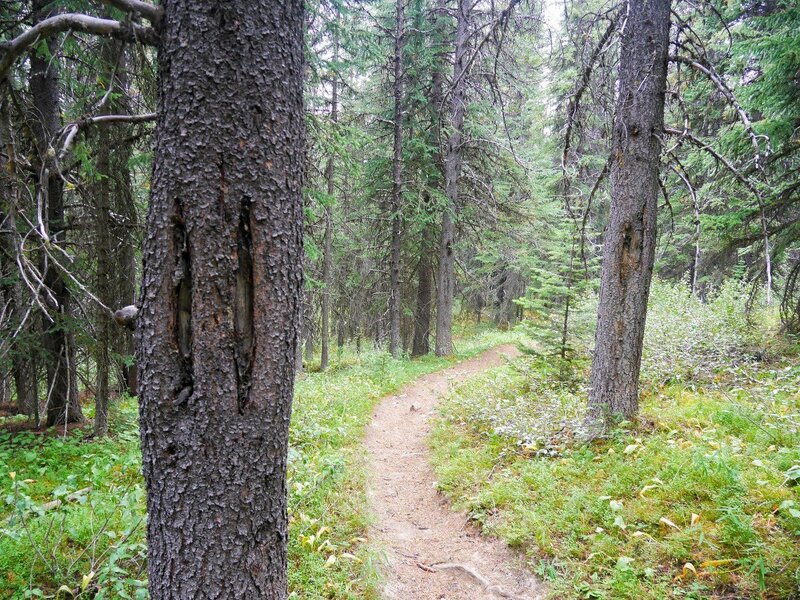 The trail enters the trees at the northeast end of the meadow, climbing and undulating gently through an open subalpine forest of whitebark pine and subalpine fir. Wildflowers grow in patches of sunlight: arnica, fleabane, and western anemone. After about twenty minutes of hiking you’ll reach the national park boundary and the height of the land. You are now in the White Goat Wilderness. The trail descends to the top of a limestone bench. 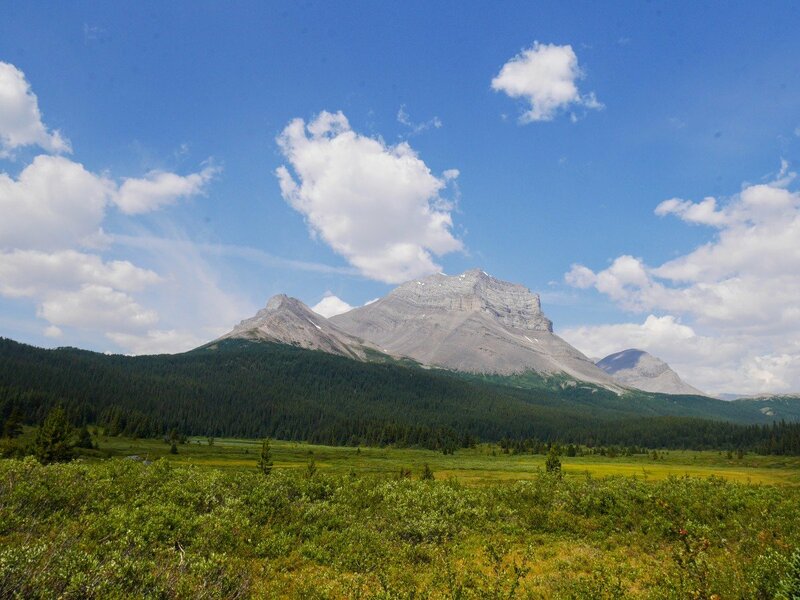 Continue hiking along the ridge to the left (northeast) for 0.5km past the park boundary sign, then to the edge of the cliff for a fantastic view to the headwaters of the Cline River and Pinto Lake. Pinto Lake was named for one of explorer A.P. Coleman’s most troublesome packhorses, which went missing on their journey home. The descent to Pinto Lake is longer than it looks, and only to be attempted if you are camping at the lake. A loop will bring you back to the trail at the top of Sunset Pass. The return trip follows the route you came in on. Just before reaching Norman Lake Campground, you’ll encounter a fork that may have been missed on the way in. Take it; it’s a small shortcut avoiding the campground, following the crystal-clear creek. 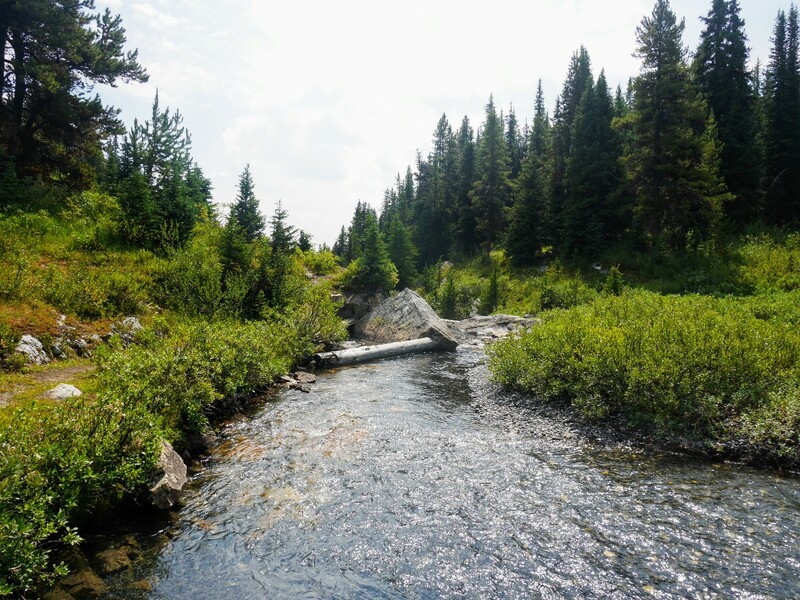 You are brought back to the location of the initial creek crossing. The waters are higher later in the afternoon – harder to rock-hop – but a dip in the cold waters of the creek does wonders to revitalise tired feet. From there, it’s all downhill! There are many different figures listed for the distances and elevation gains on this trip. The map at the trailhead information stand, and Park’s Canada’s official website, give far smaller values than anywhere else. These are incorrect (someone has graffitied the information stand to point this out). GPS used during our hike calculated the 23.0km and 950m elevation gain. This is a long, strenuous day hike. Take the side trail to Sunset Lookout on your return hike. You’ll have a better idea of how much daylight, and how much energy, you have left. Allow 1h for this side trip. In steep terrain like this, bears prefer to use human trails for ease of access, so bear spray is a must. The gravel flats of the North Saskatchewan River were popular with the First Nations of the area. Hunters often used the area to dress their kills. Explorer Mary Schaffer, on her 1907 expedition, named the area Graveyard Flats after finding animal skeletons here. The word “Saskatchewan” means swift current in Cree.